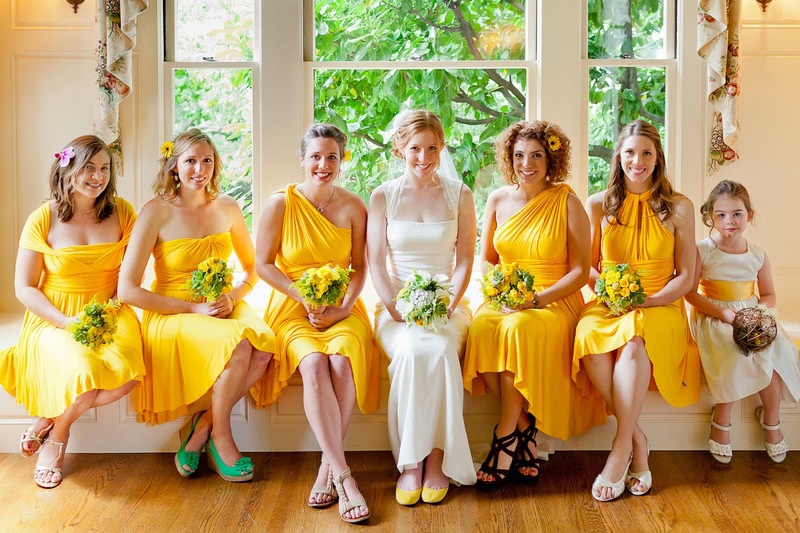 Memorable Wedding: Should You Wear a Yellow Bridesmaid Dress For a Wedding? Should You Wear a Yellow Bridesmaid Dress For a Wedding? Yellow reminds us all of bright and beautiful things. So, naturally it is one color that should be worn at weddings as a wedding is a bright and gay affair. So, what better color for an excited, happy bridesmaid waiting to see the bride start her new life? Yellow is one favorite color at weddings. It is a safe color and can suit every type of age group or personality. It is also very appealing to the eyes and is a color that refreshes. Yellow is known to have a very soothing and calming effect and looks very smart when teamed with the right add-ons. Sometimes, bridesmaids may not be able to carry the color gold easily as it does not suit every personality. In such a situation, yellow is considered a boon as it is an easy substitute for gold and it creates a look as regal and dazzling as gold. Also, if the bride's dress is a pastel shade such as lilac or ivory, then a bridesmaid in yellow will simply create a marveling effect that will capture the attention of every person and make the wedding look as beautiful as a fairy tale. Back in the 80's, people were not open to experimenting and stuck to the safe pink and whites during weddings. However, bridesmaids these days are considered to be the icing on the cake at weddings, so there has been a change in the color tones and yellow has emerged as the new pink. Yellow will suit just anyone from fair skinned bridesmaids to bridesmaids with dark skin and sharp features. It is a color of glossiness and sheen and if opted for the bridesmaids, then it is the perfect color. Yellow can be worn in various styles and in all lengths. While choosing yellow bridesmaids dresses, one also has the liberty to choose form various fabrics ranging from satin to Lycra as yellow is one color that manages to stand out in any fabric. A bridesmaid holds flowers in her hands. So, she is spoilt of choices, even in flowers as she can choose from a wide variety of flowers since yellow dresses look great with any color of flowers. Also, the bridesmaid can wear accessories in any color from purple to green, as yellow beautifies just any color! However, one drawback is that a blonde would not look so good in a yellow colored bridesmaid dress. But, if the blonde bridesmaid accessories well, the she can likely end up looking like the loveliest bridesmaid. 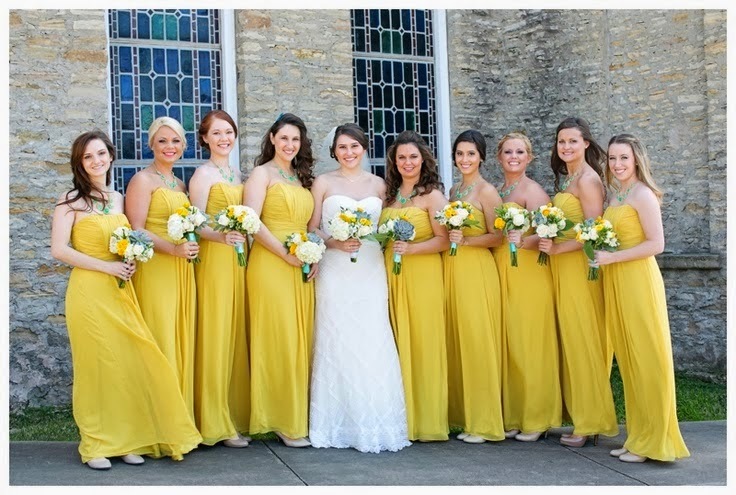 Yellow bridesmaid dresses are especially favorable for summer, as summer is about the sun and sand and what is better than a stunning bridesmaid in yellow?! 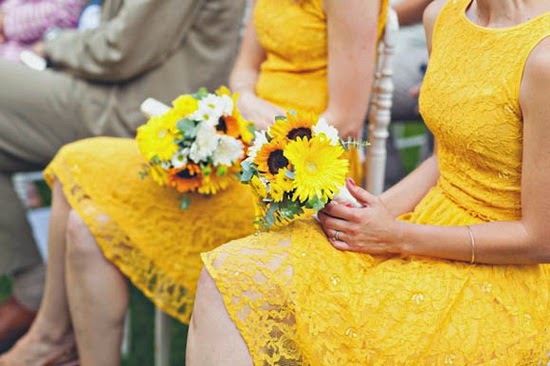 The pretty bridesmaids in yellow dresses can even give a sunflowers competition! So, if you are in any doubt that you should wear a yellow bridesmaid dress for a wedding, then do not give it any second thought and go ahead with it. Arrive at the wedding feeling like a sun goddess! So, all in all one can say that yellow bridesmaid dresses are good looking and add a shine to one's personality.